Friday's earthquake made for some empty shelves at Homer's Safeway over the weekend. 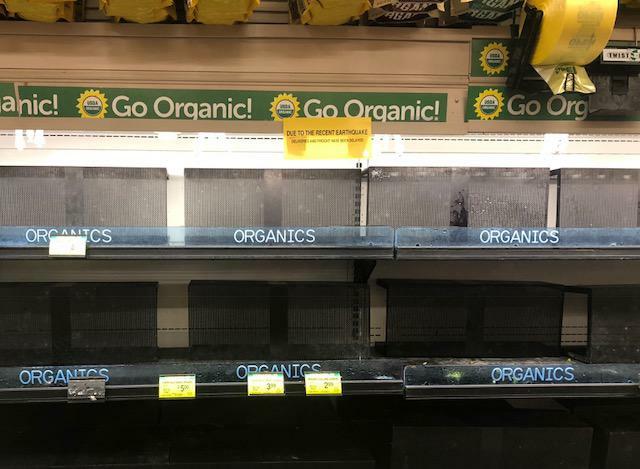 Several grocery stores on the Kenai Peninsula are stocking their shelves again after Friday’s earthquake delayed some shipments. Bob Malone is the store manager of Safeway in Homer, and he said they normally get freight delivered from Anchorage on Fridays. He says lettuce and other produce ran out and the store ran low on meat and dairy. But as of Monday afternoon, the store was expecting a full delivery that evening. He said Anchorage employees did a good job making sure outlying stores, such as their Homer and Soldotna locations, received shipments. Save-U-More in Homer says it’s also receiving some shipments late.